In "Glass," local native son M. Night Shyamalan's hit film that came out in January, the movie continuously hints at a major, climactic confrontation between hero and villain atop a huge skyscraper in Center City. But then, in one of M. Night's patented twists, that battle never takes place. "Shazam!" is set in Philadelphia, despite existing in a cinematic universe that also includes such fictional realms as Gotham City and Metropolis. However, the film was shot primarily in Canada, at a variety of locations that included Pinewood Toronto Studios and the University of Toronto. While the main production of "Shazam!" only spent a handful of days here in Philadelphia, there's a whole lot of Philly in the film. And through a combination of CGI, second-unit work, and suspension of disbelief, the production faked it quite well. • The film begins with several overhead shots of Center City, including the Schuylkill River, above the Art Museum, the top of the William Penn statue, and other familiar spots. William Penn comes into play again later on, as does the LOVE sculpture. • There's not one but two scenes set at the top of the Art Museum steps, and both include overt "Rocky" references, including an improvised song set to "Rocky III" theme song "Eye of the Tiger." Our HughE Dillon spotted the scenes being filmed last December, for the Christmastime-set movie. • Judging by street signs, one scene appears to be set at 9th and Bristol, near Hunting Park in North Philadelphia. • A character at one point steals a bag from Geno's Steaks from a couple of police officers, although we don't see the cheesesteaks or the restaurant. • There's one scene in which main character Billy jumps onto the Market-Frankford line at 40th Street and- a brief supernatural interlude later- he gets off the train at 30th Street. Some watchers of the trailer have argued that the SEPTA stations look unrealistically clean. • Billy's school, Fawcett Central, isn't real, but the geography of that train scene indicates that both the school and the kid's home are supposed to be somewhere in West Philly. • During a scene in which the characters are considering what name to give the adult version of the superhero, one of the suggestions is "Mr. Philadelphia." 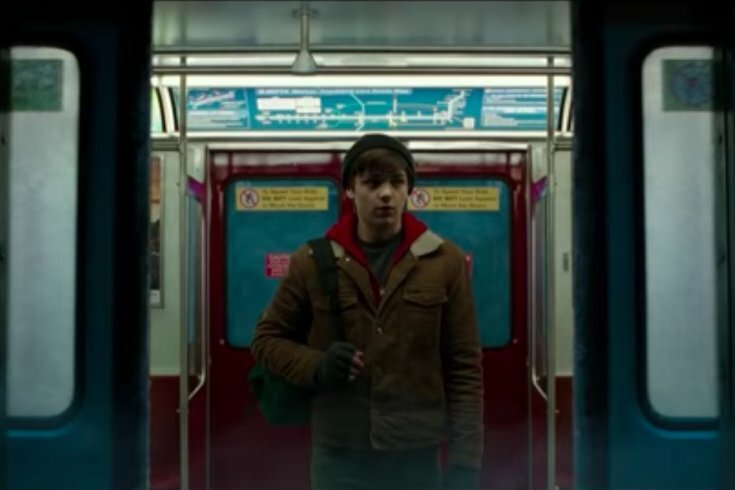 • A lot of what we see of Philly in "Shazam!" takes place above the city. Besides those establishing shots, there are a whole lot of fights both on tops of buildings- including one that appears to be next to the old PSFS Building on Market Street - and in the sky high above Center City. This approach, in addition to possibly delighting disappointed watchers of "Glass," presumably did not necessitate the actors actually coming to Philadelphia to shoot those scenes. The authenticity only goes so far, however. There's a major scene involving a SEPTA bus, although where that scene is set geographically resembles something of a mishmash of real places, depending on the angle. Also, a major setpiece takes place at a nonexistent event and location called the "Chilladlephia Winter Carnival." No character has much of a Philly accent, no one wears clothes with the insignias of any local sports team, and everyone refers to SEPTA as "the subway." And in one scene, the characters go to a convenience store, which is stocked to the brim with Hostess products- but there's not a Tastykake in sight. "Shazam!" is the third of four Hollywood films shot at least partially in Philadelphia to come out this year, following "Glass" and "The Upside"; "17 Bridges," with Chadwick Boseman, arrives later this year. That doesn't include various independent films, including "Made in Chinatown." We'll leave it to local film historians to decide whether "Shazam!" counts as a Philadelphia movie, but there's no question that the film presents the city well, even if somewhat imperfectly.